Bear and Son Boy Scout Knife, 5 "blade"
There is a boy scout knife being sold on Ebay, which is a handsome piece. I claim no knife expertise, but I couldn't find this anywhere, and this week I've looked at scout knives until I turned blue. Any comments? So, I have a Bear & Son Boy Scount Knife (attached). It is a nice pice for my collection. 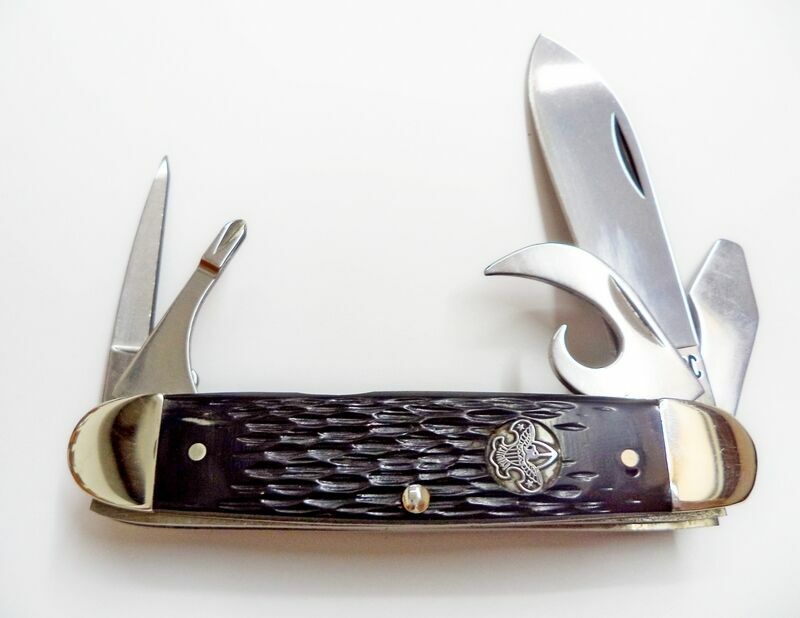 I found the one about on E bay and I would say in my opinion since it comes from Red hill Cutlery it is authentic. They have more than 10 available. I would try calling or e mailing Bear & Son to see what they say. BTW for the 15.00 on e bay the knife pic I attached is nice. The BSA website has a similar knife in the attached link for a fraction of the cost. However it doesn't say who makes it. Upon closer inspection, this KY dealer, selling on Ebay, clearly states, in fine print at the end, that all these knives have some main blade play. I worked in industrial manufacturing in one of my lives, and I am now convinced that these knives were samples, from Bear's R&D. I wouldn't buy one at any price, since I wouldn't want to use a defective tool. Later in the week, he offered another BSA, and the BSA shield logo was facing the wrong direction. He has a few of these as well. They might be a good buy.